Jan 15, 2017: How's this for a first build? Apr 02, 2017: Former Mac user with first-ever PC build... My HDD isn't show up? Apr 20, 2017: So one of my older HDDS(10 years or so) is starting to make a clicking noise. I want to replace it...thoughts on options? May 08, 2017: I don't know if this parts will actually work together. May 19, 2017: RAM problems? New build won't boot. May 19, 2017: New build won't boot. RAM problems? Jun 27, 2017: Best external/portable hard drive for a videographer? Jul 06, 2017: SD Card Backup for college students. Jul 07, 2017: Is Seagate still notorious for drive failures? Aug 02, 2017: Are Seagate BarraCuda drives good for NAS? Jan 31, 2018: Setting up a second SSD, but I'm having trouble utilizing the entire drive? 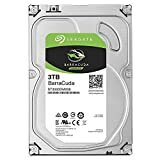 Feb 28, 2018: Would an SSHD be a good secondary drive for my modded games? Jun 01, 2018: Computer won't boot, can't find the cause. Dec 14, 2018: I've Got 4 Hard Drives For A New PC Build. How Should I pick my Windows OS, Mac OS, and Scratch Disks?